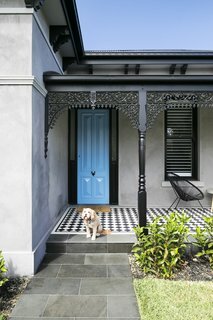 A careful renovation saves this Victorian home in Melbourne from losing its historical charm. 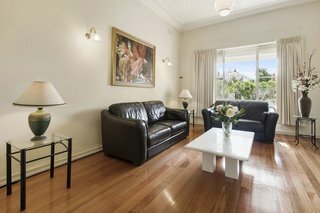 In 2014, Steph Hegerty and her husband purchased a Victorian on Liscard Street in the Melbourne suburb of Elsternwick. 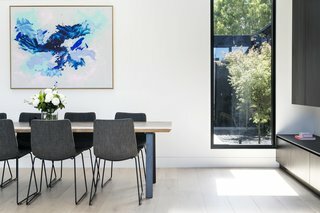 The house had been so badly remodeled in the 1970s that most of its historical details were no longer visible, so the couple renovated it into a contemporary residence that’s now available for purchase through NOKK, a new property platform that brings more stock and transparency to the real estate market. "Except for the hallway arch and pressed metal ceilings, most of the house’s original charm had been erased. But we were still able to see the potential in the house. 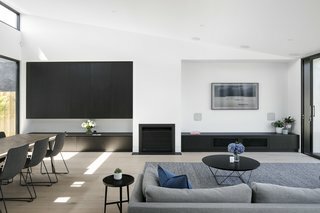 We had always wanted to take on the challenge of a renovation project, so we thought this was the perfect opportunity," says Hegerty. 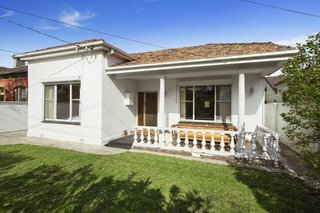 The renovation demolished the entire back half of the house and added a new extension. The team stripped the original Victorian front section down to the walls. The couple reintroduced Victorian architectural details such as a bullnose veranda roof, lacework, and window moldings. "The floor came out, the roof came off, but aesthetically, the biggest changes were to the windows," says Hergerty, who removed the old aluminum windows and installed beautiful timber sash windows to improve the look of the facade. One of Hegerty's key goals was to bring as much natural light into the south-facing aspect as possible. She accomplished this by adding a 13-foot-long highlight window that keeps the main living areas bright throughout the day. Most of the furnishings are from from Globe West. 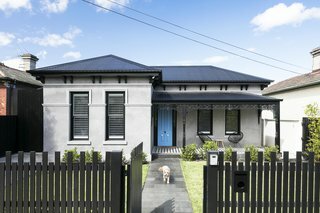 Hergerty says she's always dreamed of renovating a Victorian or Edwardian house, and turning it into a modern and relaxed family home. 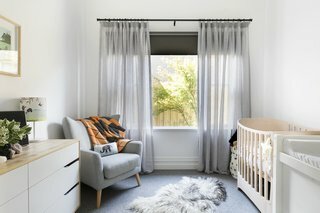 "We have two young kids, so the floor plan needed to be really practical," she says. 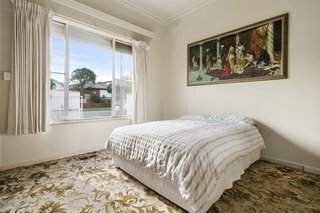 The bedroom before the renovation. 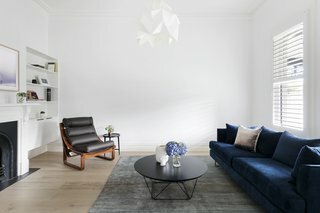 Cool blues, grays and blacks give a home an elegant, calming vibe. 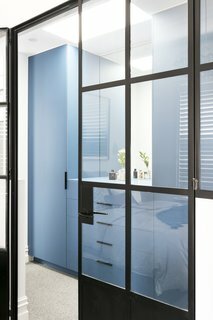 To jazz up the master bedroom, Hegerty and her husband chose cabinetry with a matte, denim-blue Laminex finish. 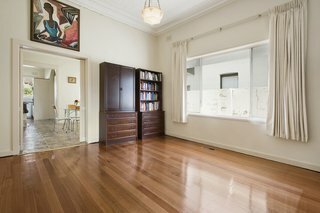 "It wasn't until we started the renovation that we were able to determine the state of original house. The brickwork structure of the house, which was set upon bluestone footings, was rock solid, but we ended up having to replace the trusses, which was quite a hefty variation. 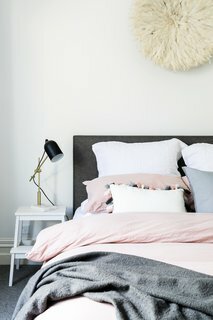 We also didn't know the state of the plaster in the front half of the house until we stripped all the paint off the walls, so we had to decide as we went along," says Hegerty. One of the four bedrooms in the house. 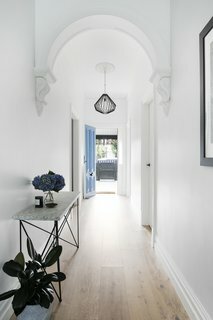 The home's entryway is bright white, with subtle Victorian accents. Though Hegerty and her husband are rookie renovators, they report that the remodel went pretty smoothly. The biggest challenge for them was working through the uncertainty of which parts of the house to retain, and which to change. 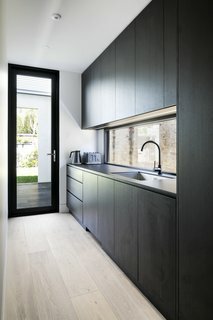 The simple and elegant new kitchen. 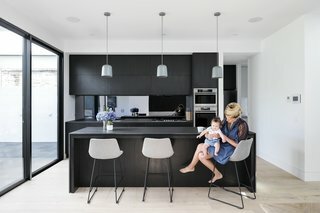 The open-plan kitchen features durable Neolith benchtops, a smoked glass backsplash, and cabinetry with a carbon-colored timber veneer. Engineered oak boards make up the flooring in all areas of the house except for the four bedrooms and three bathrooms. 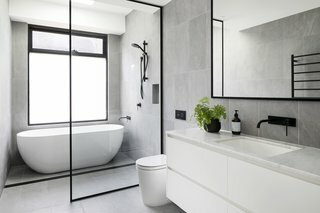 The couple used Phoenix tapware, tiles and marble benchtops in the wet areas of all the bathrooms. 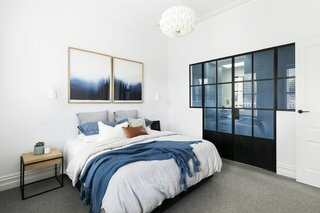 Have your own renovation to share? Read our submissions guidelines and tell us your story!